Below is a list of Bowness and Windermere Attractions with Websites, Photos, Phone Numbers, Information and links to Maps and Reviews. Click on the Postcodes for Maps & Reviews. 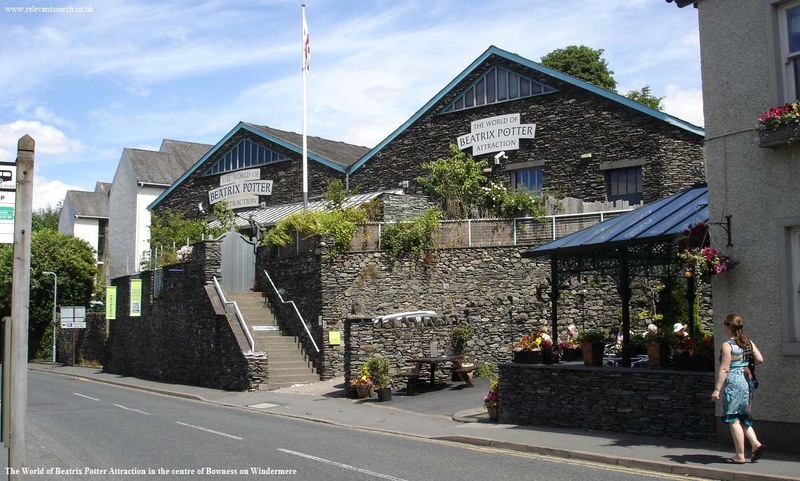 The Bowness and Windermere Attractions are listed by closest to Bowness. Bowness Boat Tours on Lake Windermere. There are a number of boat tours from the Pier at Bowness, on large three deck boats with a bar, or a number of smaller boats. There is also a good selection of rowing boats and motor boats for hire. The boat tours go to the islands, Ambleside about 5 miles north, and Lakeside about 7 miles south. There are large pay and display car parks south of the pier. Phone number 01539 443 360. The World of Beatrix Potter Attraction. In the centre of Bowness on Crag Brow. Discover Peter Rabbit and Jemima Puddle-Duck in a museum covering Beatrix Potter's 23 famous stories. Phone number 01539 488 444. Windermere Steamboat Museum. On the north side of Bowness on Rayrigg Road. A collection of historic vessels showing the development of boatbuilding in the Lake District over 200 years. Kankku OffRoad Driving 4x4s. In the centre of Windermere on Victoria Street. Tracks in the Lake District National Park for complete beginners and experienced 4x4 drivers. Phone number 01539 447 414. Blackwell, The Arts & Crafts House. Situated about 2 miles south of Bowness. An historic house with views over Lake Windermere and with a popular cafe. Phone number 01539 446 139. Brockhole Visitor Centre. Situated about 3 miles north of Bowness. Enjoy the scenic gardens, treat yourself in the cafe, take a Treetop Trek, bounce around on the Treetop Nets, and lots of great attractions. Phone number 01539 446 601. Holehird Gardens. Situated about 3 miles north of Bowness. The gardens are open each day throughout the year from dawn til dusk. The reception desk is open from April - October, 10:00 am - 5:00 pm. Phone number 01539 446 008. Low Wood Bay Watersports Centre. Situated about 4 miles north of Bowness. Instruction & Hire include dinghy and keelboat sailing, canoeing, kayaking, waterskiing, wakeboarding and powerboating, and have available for hire motor boats and rowing boats, sailing dinghies and keelboats, sit-on-top kayaks and open canoes. Phone number 01539 439 441. Stagshaw Gardens. Situated about 4 miles north of Bowness by Ambleside. This 8 acre garden has a vast collection of rhododendrons, camellias and azaleas, as well as many other rare trees and plants. Phone number 01539 446 027. Hill Top House. Situated 3 miles west of Bowness via the car ferry at the small village of Near Sawrey. Hill Top House was Beatrix Potter's 17th-century farmhouse that she bough in 1905 with the procedes of her first book, the Tale of Peter Rabbit. The house has been maintained as it was when Beatrix Potter lived there. Phone number 01539 436 269. Esthwaite Water Trout Fishery. Situated 4 miles west of Bowness via the car ferry. A first class, well managed Trout fishery in a natural 280 acre water with excellent facilities for boat or bank fishing. Phone number 01539 436 541. Ambleside Roman Fort. Situated about 5 miles north of Bowness by the town of Ambleside. The remains of a 2nd-century fort thought to have been built by Hadrian to guard the Roman road from Brougham to Ravenglas. Managed by the National Trust. Phone number 0870 333 1181. Grizedale Forest. Situated 8 miles west of Bowness via the car ferry. The park offers GoApe Zip Lines, Walking Trails, Cycling Trails, Outdoor Sculptures, Cafe, Shop and more. Phone number 01229 860 010. Wray Castle is situated about 8 miles northwest of Bowness on the banks of Lake Windermere. Wray Castle was built in 1840 for a retired surgeon, James Dawson from Liverpool. The National Trust took over the property in 1929, but have only recently opened it to the public on a regular basis. You can catch a Boat that runs from Ambleside and Bowness to the castle with an option for a walk as well. Phone number 01539 433 250.